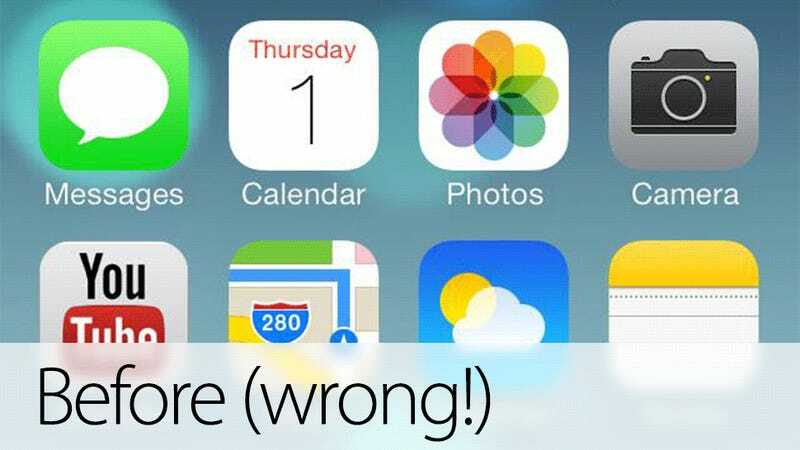 Rejoice, humans of the Earth, for the ugly off-center 1 in Apple iOS 7's Calendar app icon has been at last, FIXED! It took almost two entire years of design rants after every update, but someone in Cupertino has at last listened and corrected what was a horrible design decision made by someone else who is no longer in Cupertino. iOS 7 beta 4 has a perfectly centered 1. The problem on the left was not as obvious as before because it was a lighter font. But instead of using the numeral's bounding box, they should have used optical positioning, taking into consideration the visual distribution of the figure so it didn't appear horribly off center. Now, this has been corrected. Notice that the stem is not centered in the corrected version, which is the one I kept pushing for. It's just moved sightly to the left to optically compensate for the ear on top of the one. It's good to see that, with Jony Ive at the helm, Apple's former insanely obsessive attention to detail is coming back to Apple. Even better: they listen. p.s. Oh, and to all those Apple fanboys who said it was perfect before, I hate to say I told you so but—wait no, I don't hate it. Now TFSU.